PHUKET: An official from the Department of Marine and Coastal Resources (DMCR) has today told The Phuket News that he believes that a crocodile caught on drone video footage swimming off the coast of Bang Tao Beach on Phuket’s west coast is likely to have escaped from a crocodile farm. 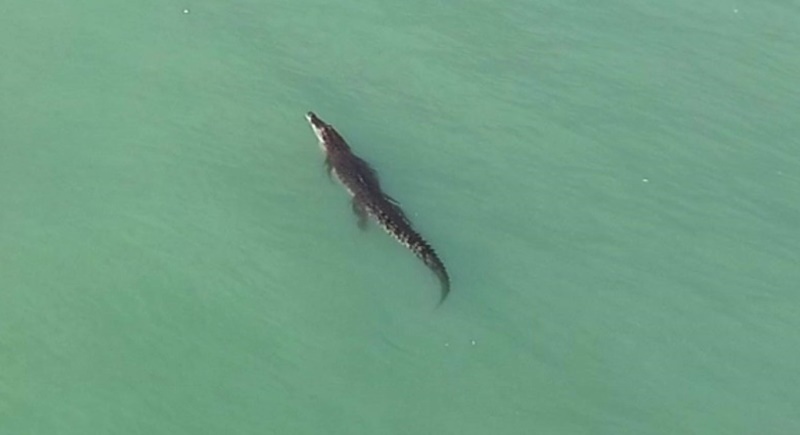 The drone footage, sent to The Phuket News last week, begins by showing a panoramic shot of the waters at Bang Tao Beach and them zooms in to show a large crocodile, estimated to be about seven feet long, swimming along the coast. The video was sent along with the message: “I have drone footage of a 7ft crocodile just off the beach of Bang tao. Director of the Phuket DMCR’s Conservation Department Mr Suchart Rattanareangsri said today (Aug 29), “It is highly unlikely that the crocodile was born and bred naturally in the waters of Phuket’s west coast. It most likely escaped from a nearby crocodile farm. “We have had cases of crocodiles being sighted around the island of Phra Thong, however, the western coastal area of Phuket is not normally an environment that crocodiles come from,” he said. “I have notified the director of the Phuket Marine Biological Center (PMBC), and the fisheries department. They are the ones who monitor and record numbers and whereabouts of crocodiles in Phuket,” he added. An official from the Phuket Provincial Fisheries Office who declined to be named said, “We have not received any news recently of crocodiles going missing from farms. However, tomorrow (Aug 30) our officials are going to go to Bang Tao Beach to investigate the crocodile that was spotted and we will contact farms to find out about any reports of missing crocodiles. “We cannot just guess where it came from, we have to investigate the issue,” she said. “Freshwater crocodiles can swim in saltwater,” she added. Calls to the Director of PMBC Dr Kongkiat Kittiwattanawong made today by The Phuket News went unanswered. Should you happen to spot the crocodile please call the Phuket Provincial Fisheries Office on 076-212460. Did the Phuket Provincial Fisheries Office already find out or there is a croc missing from the farms as promised by a official who declined to be named?